The Academy Honorary Award is awarded by the Board of Governors of the Academy of Motion Picture Arts and Sciences. Given as a Special Award since the 1920s, only a few composers have won for their lifetime work in the industry. At the time of their respective awards, none have received a competitive award - perhaps this could be seen as an Academy Award correction. With Lalo Schifrin's Honorary Award ceremony in November, 2018, let's look back at the previous winners and their past Oscar history. Honorary Academy Award 1985 "in recognition of his brilliant artistry in the creation of memorable music for a host of distinguished motion pictures." 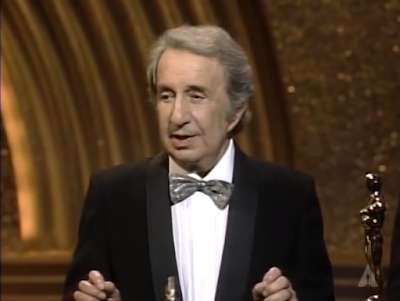 North was the first composer to receive this Honorary Award after his 15 nominations (and losses) to composers Franz Waxman, Dimitri Tiomkin, Alfred Newman, Victor Young, Ernest Gold, John Addison, Maurice Jarre, John Barry, John Williams and Vangelis. Honorary Academy Award 2006 "in recognition of his magnificent and multifaceted contributions to the art of film music." In 2016, Morricone won the Oscar for Best Original Score for The Hateful Eight (2015). 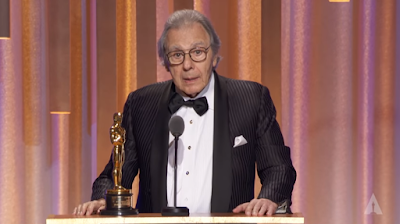 Fun fact: this win made Morricone the oldest Oscar winner at 87, until 89 year old James Ivory won for the screenplay of Call Me By Your Name (2017). Honorary Academy Award 2018 "in recognition of his unique musical style, compositional integrity and influential contributions to the art of film scoring."